This tutorial shows you how to create your own light-weight process Workbench ideally suited for prototyping algorithms on process (and other) models. We assume that your are familiar with the Hello World tutorial. The lines of code required are even fewer than for Hello World, since the Workbench class is already a Java Application with a JFrame. The running program should look like this but just with an empty model. 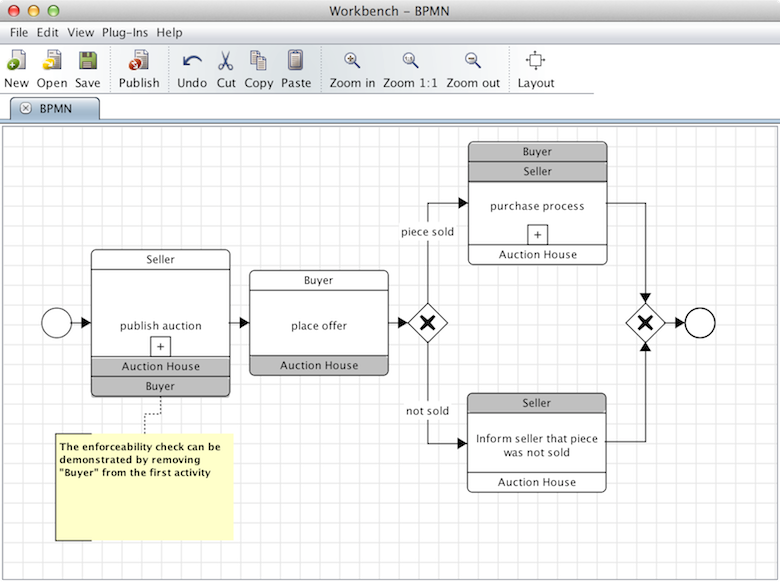 You can find the BPMN 2.0 Choreography auction model here. The ProcessEditor as well as the corresponding Workbench use a preferences file for persisting properties. You can find a UI in the workbench at (tbd). The workbench provides a number of Plugins, which can be easily extended. You can find the Plugins under the corresponding menu item. Just try them out with a few sample files (tbd). A standard use-case of the Process Editor framework is writing a plugin for a certain model type. As you've seen above, a plugin can implement arbitrary algorithms on models, so it is suitable for prototyping an algorithm of a thesis. If you need your own model first, please check the corresponding tutorial. We will showcase a simple plugin that checks whether a given Petri net is a Workflow net. A more advanced implementation might sub-class the workbench (tbd).